Mixology is an art that rewards precision. 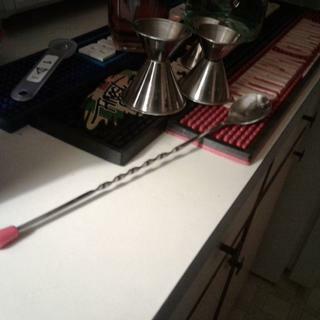 Even pro bartenders still need a dependable cocktail jigger for the accurate measuring that ensures world-class drinks. Having your bar measurements on hand is a key to providing your bar guests with perfectly-poured cocktails just the way you want them. These bartender jiggers, available in three convenient sizes, will have you ready for any drink you're mixing up. This double jigger is made of durable stainless steel and has two functional sides. The alcohol measuring cup in each is large enough to make for easy pouring from any bottle, and for accurate measurement. Stop ruining your drinks with heavy-handed pours. Put a stainless steel double jigger behind your bar and you’ll be a drink mixing maestro! Every bar needs a set of these! Making my home bar awesome! This American-style jigger is our standard for the house because of durability and price.